Lesotho is a high-altitude, landlocked country, encircled by South Africa. It is criss-crossed by a network of rivers and vast mountain ranges, which include the 3,482 metre-high peak of Thabana Ntlenyana. It is the only country in the world to be entirely above 1,400 metres in elevation. The country’s unique geography has earned it the title of Africa’s “Kingdom in the sky”. Lesotho has a temperate climate with well-marked seasons, clear blue skies and over 300 days of sunshine. 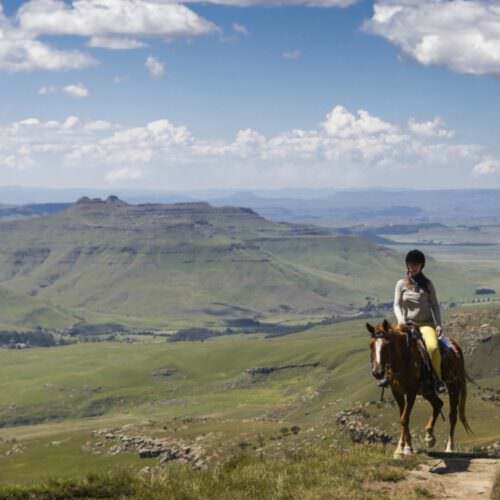 If you are looking for an adventurous horseback expedition, then Lesotho is the ideal destination. The remote and untouched landscape is not easily accessible to tourists and offers fantastic and challenging riding holidays. Expect long days in and out of the saddle, and basic facilities, with opportunities to spend time with the local communities of this remote kingdom. The riding terrain includes high mountain passes providing spectacular views, alpine lakes, rivers, rock pools, waterfalls and distinctive rock formations.